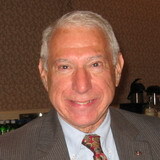 IRA BERNSTEIN was invited to join Mount Vernon Rotary Club shortly after starting his optometry practice in 1960 and was inducted in February 1961. When he combined his Mount Vernon and Mount Kisco offices in 1969, he was recommended for membership in the White Plains Rotary Club and been active ever since. In 1972-1973 he was elected Vice President and served as President in 1974-1975. In August 1974, he hosted a family barbeque at his house which was attended by 94 members of the White Plains Rotary family which included 37 Rotarians, 23 children and invited guests. To present, he has served on and/or been chairman or co-chairman of the program, bulletin, youth, by-laws, nominating, club history, Rotary Foundations, membership, pre-induction, induction and 75th anniversary committees. His district involvement includes being district coordinator (assistant to the Governor in 1976-1977 and having served as an area representative twice). He has been co-chairman of the On-To-Bermuda trip as well as having served as registration chairman for four District conferences. Additional district activities include serving on the committee for selection of Rotary Foundation Ambassadorial Scholars and chairing District Assembly meetings on membership, club service and community service as well as having been secretary for the District Nominating Committee. Ira became a Paul Harris Fellow in 1975. His son Warren took part in a Rotary summer student exchange program in England while he was in high school and his family has hosted international exchange students and visitors associated with Rotary. Since his children grew up with Rotary, it was fitting that son Paul became a White Plains Rotarian over 25 years ago. Professionally, Ira has B.S. and M.S. degrees from Columbia University and a Doctor of Optometry degree from Pennsylvania College of Optometry. He has been president of the Westchester-Rockland Putnam Optometric Society, New York Academy of Optometry and the Organization of Optometric Educators in Binocular Vision, Perception, and Vision Development. After having taught at the Optometric Center of New York and SUNY College of Optometry for 40 years, he retired in 2000 as Associate Professor Emeritus. Some community activities have included being Co-Chairman of the Mount Vernon Distinguished Service Award Committee, coaching rec league baseball, chairman of his Temple Board of Education and Youth Committee, and vision consultant to public and private schools. Ira and Phyllis celebrated their 56th wedding anniversary and are looking forward to the wedding of their youngest son Andrew this coming November.